For TPB Opportunities email to careers@tpb.gov.ph. For TPB Vacant Positions email to vacancies@tpb.gov.ph. 8. Hard copies of the following documents must be submitted to facilitate proper evaluation. The TPB Personnel and Human Resources Development Division and the Personnel Selection Board reserve the right to request for additional documents as it deems necessary. Submission of intent, confirms the candidate’s understanding and acceptance of the TPB Guidelines on Personnel Selection. Applications will be considered valid for a period of one (1) year. WHEREAS, the Tourism Promotions Board Personnel Selection Board (TPB PSB) agreed on the following guidelines and procedure in processing of application for hiring and promotion and was approved by the Chief Operating Officer. Selection of employees for appointment in the TPB shall be open to all qualified men and women according to the principle of merit and fitness. Employees with pending appeal with the CSC relative to the disapproval of their appointment to the reorganized TPB may not apply to other positions pending appeal, unless they withdraw their appeal. Pending administrative case will not be a hindrance in promotion pursuant to Section 42, Rule 8 of CSC Resolution No. 1101502 (Revised Rules on Administrative Cases in the Civil Service or RRACCS) dated 08 November 2011. Request to open vacant positions shall be made by the concerned department head, endorsed by the Deputy COO (DCOO) and approved by the COO. In the absence of incumbent officials, request and endorsement to the COO shall be made by the highest official in the concerned office/sector. Once approved, the TPB Personnel and Human Resources Development Division (PHRDD) shall evaluate the application based on existing Civil Service Qualification Standards and preliminary interview of the Chief of PHRDD. Candidates who pass the initial screening shall be given a psychological and aptitude testing by an external service provider. A candidate who is recommended for the position shall undergo interviews with the Administrative Manager, Division Chief (DC) and/or Department Manager (DM) where the vacancy exists, and the DCOO concerned for endorsement to the TPB PSB. In the absence of incumbent officials, interviews and endorsement to the COO shall be made by the highest official in the concerned office/sector. Applicants for promotion and lateral transfer will have to go through the entire process. – appellant passed the PPC assessment to the position appellant will be considered to. Written examination shall be done by an external service provider hired for this purpose. The minimum required overall rating shall be moderately recommended and average / normal for psychological and aptitude testing respectively. Assignment of points and weights shall based on the rating criteria hereby attached as Annex A. In case of more than 1 applicant rating system applies. 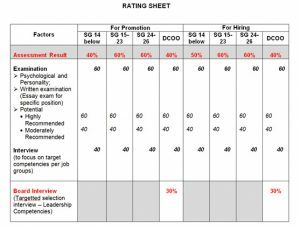 To promote objectivity in the promotion system, rounding off of over-all rating shall not be allowed. officials shall have been appointed thereto. The conduct of written examination is mandatory for all applicants (promotion, lateral transfer, and hiring). External applicants shall undergo pre-screening process simultaneously with internal applicants. However, all things being equal, internal applicants shall be given priority in filing up of vacant items.